Upon arrival, after the official signing in to the school, we were met and were made very welcome by the Head Teacher Ms. Nugent and the staff of English Martyrs school. We then proceeded to set up our resources in the school hall. 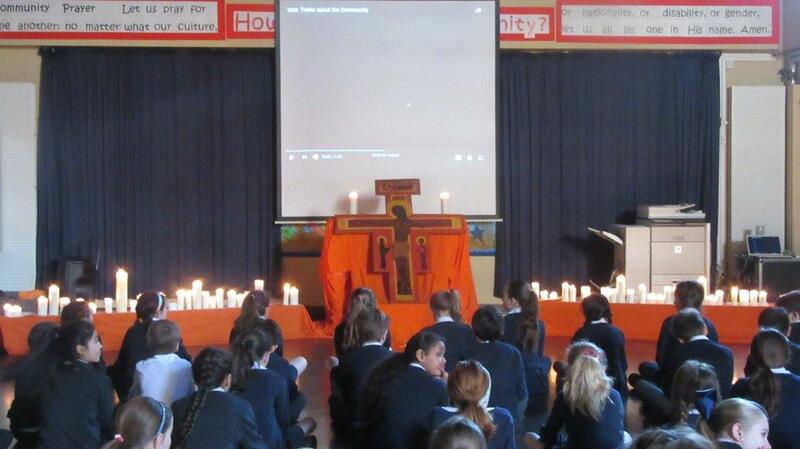 Close to a 100 pupils started to gather in the school hall and as they entered, you could see the sense of wonder and curiosity in the eyes and faces of the children as their school hall front stage was now transformed with the presence of the Taizé cross along with vibrant orange coloured drapes and candle lights. Ronan introduced the background and context of the Taizé prayer with help of a short video of Taizé. We then had a time of prayer singing simple Taizé chants led by Dawn and Ronan and the rest of the group supported in song. There was a short scripture reading shared in between the Taizé chants. Considering their age, the children showed a marvellous sign of maturity as they were so present, engaged and attentive to what was going on. They even managed to learn the simple chants so quickly and sing them out aloud so well. 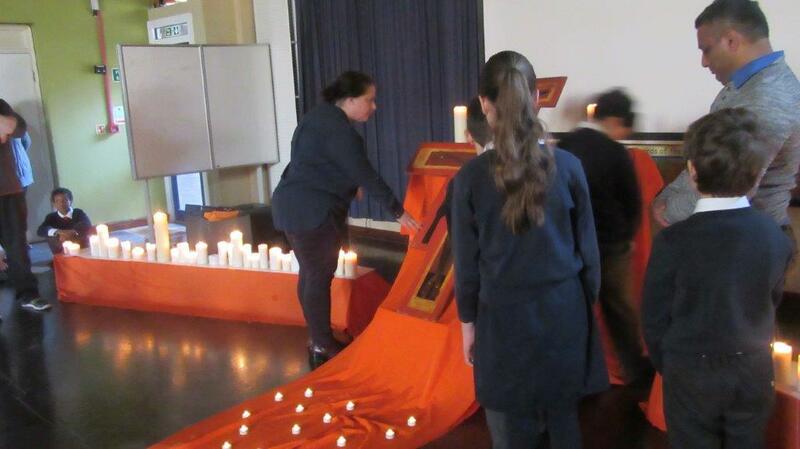 At the end of the prayer time, the children were encouraged to come up and touch the Taizé cross and say a short prayer. It was such a beautiful experience to encounter children and staff together in a communion of prayer. “This experience of prayer can help you go to deeper places inside yourself when you are really feeling stuck and you long to get help with difficult moments of your young lives”. 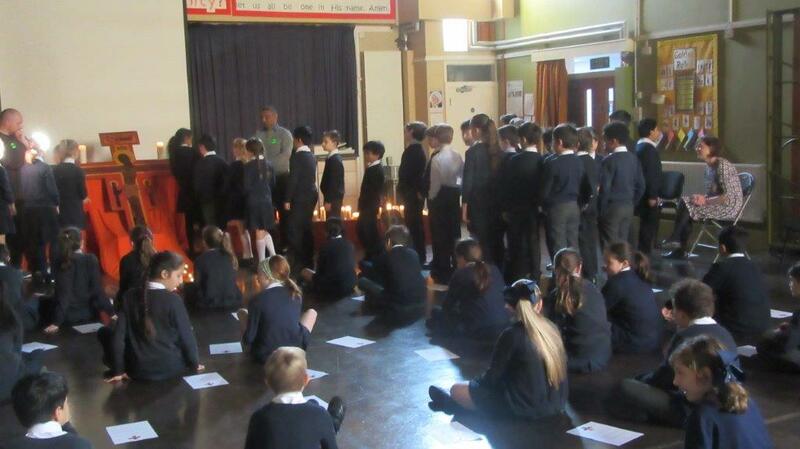 Here are a sample reflections of what the children at English Martyrs had received from that first experience of Taizé prayer. The Taizé experience was calming and soothing. It connected me with God and the candles and the cross made me surprised by the lights in the dark room. 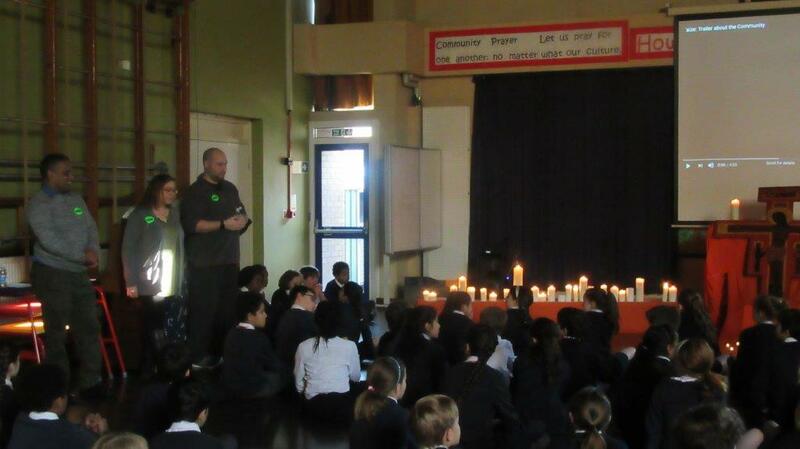 There was also a calming and gentle atmosphere during the singing. The Taizé experience was so relaxing, calming and had a beautiful atmosphere. When it came to singing all in time and so smooth it was like a lullaby. The orange cloth and the candle made you so welcomed and warm in heart. I really enjoyed the Taizé experience because when I frist entered the hall I felt so impressed. I felt magic entering my heart. The singing relaxed me a lot, the warmth and welcome just was so beautiful. 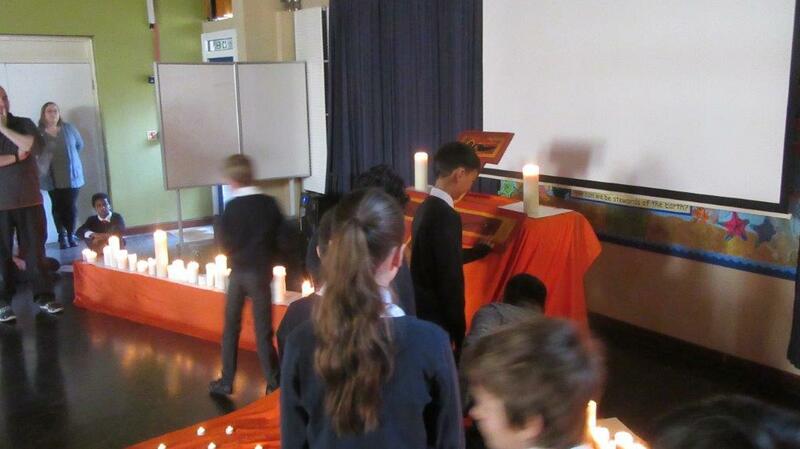 The Taizé assembly that we had at school was a perfect time to pray to God. When we came into the hall I was overwhelmed by the beautiful, heart-warming candles that flickered their bright orange light. Singing the same tune over and over again is a peaceful way to connect with God in your own time. I enjoyed the Taizé experience for it was very warm and welcoming. I could feel a reflecting atmosphere coming from the display. Your aim was to connect us with God. It worked. When we were singing, it sounded like all the voices were as one. It was soothing, calming and relaxing. The orange was very affecting and was rather beautiful. Taizé – I really enjoyed it because it made all your worries go away. I felt overwhelmed all the candles lighting up the room – it made me feel really kind and happy. It was a really wonderful experience. Thank you Taizé for the calming experience with God that took away all my anger and worries. The candles warmed me down to my heart and it made me feel connected with the people singing to God. I find the Taizé comforting and relaxing because I connect and it felt like all my worries had disappeared. The candles gave a soothing motion because it reminds me of God that is our light in the darkest of times who loves us and forgives our sins. It is like a sweet oblivious balm of prayer, like a meditation, it helps us to be closer to God and to be a better person. In the Taizé experience I felt calm and as soon as I walked in the hall I was overwhelmed by the beauty and I felt warmth in my heart it was so welcoming. This gave me time to think about life. While we were singing we were all in sync which was so soothing.